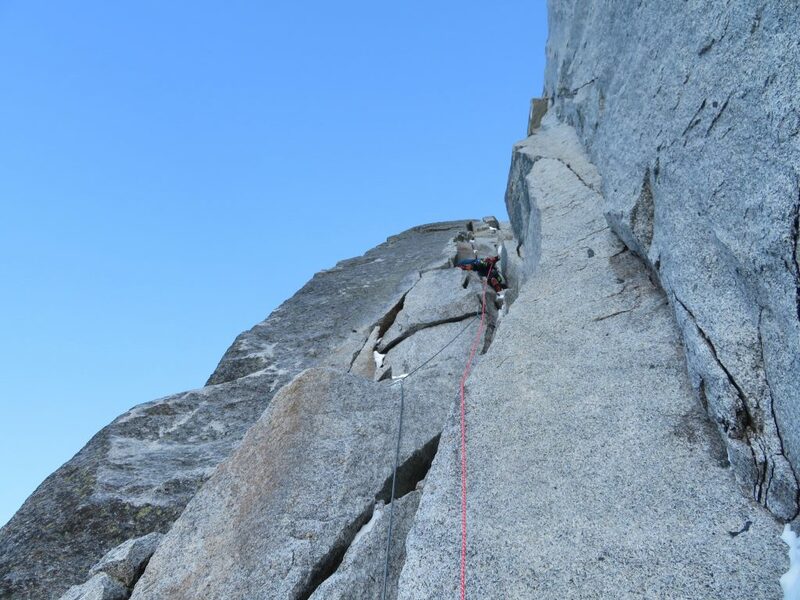 I’ve wanted to climb Les Drus north face for many years now, but since 2014 conditions have not been that icy. I always thought that there must be loads of hero neve covering corners before I’m willing to go there. Well, years have been dry. 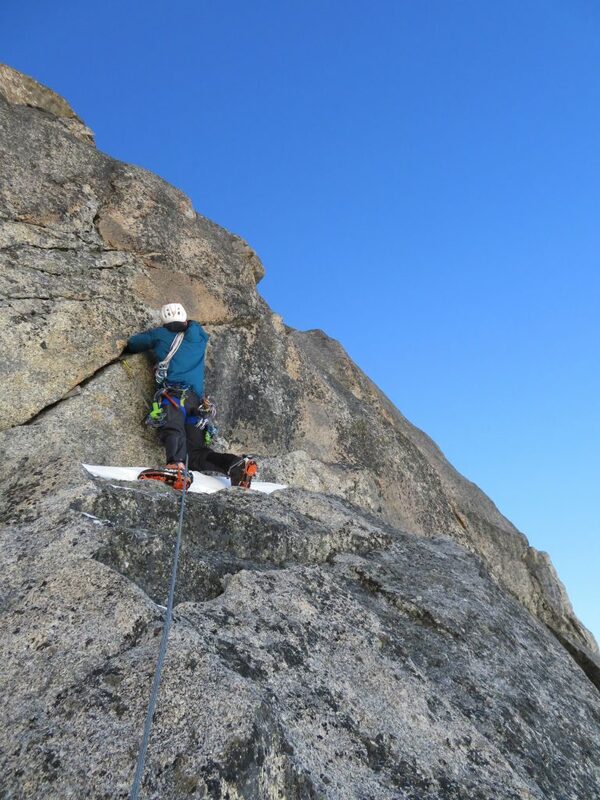 Evolution of tackling big north faces in dry tooling style is more and more common. Also I slowly adapted my mind to it. Of course at the same time my own climbing ability has grown. That means more confidence and reserve to climb harder routes. Les Drus with Nant Blanc face of the Aiguille Verte on the left. 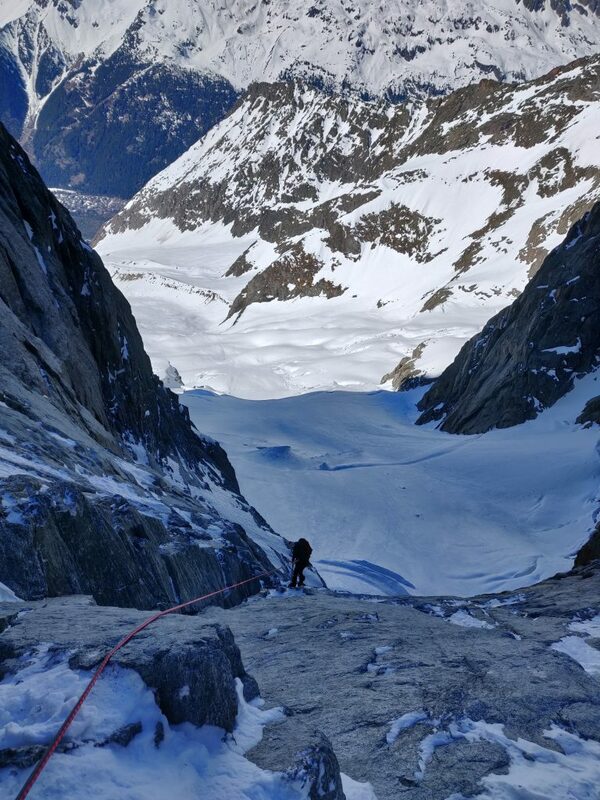 This spring I came to Chamonix to learn how to ski but as a climber there’s no way one can hide burning flames and stoke to be around Europe’s coolest mountains. Eventually the weather window arrived. 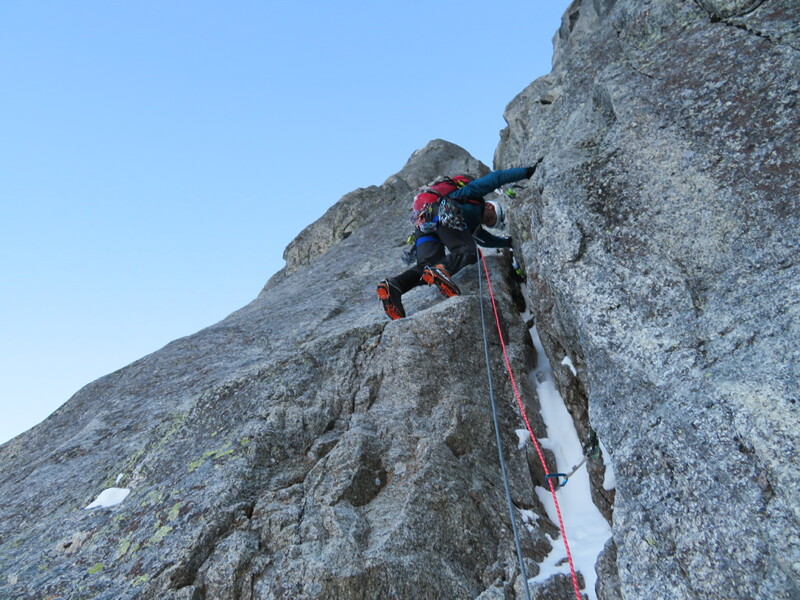 I teamed up with native Etienne whom shared the same idea of climbing a big alpine route. An objective wasn’t that hard to pick. Conditions limited out plenty of options. So Voie Lesueur on the Dru it would be. Quite a few teams actually climb the original line. Start of the route is more logical via Allain-Leininger as the whole line follows weaknesses rather than line straight up to the summit. 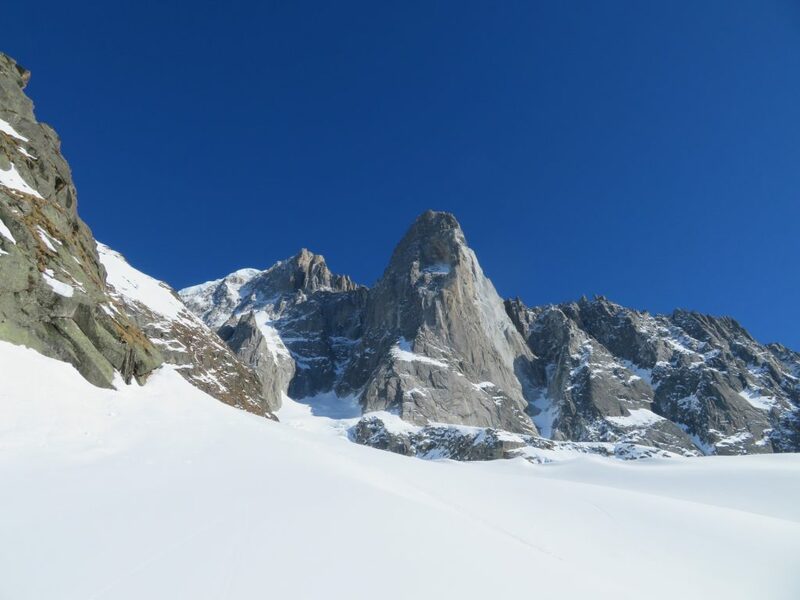 In the end many of the teams finish to the breche of the Drus, to the summit of the Petit Dru or climb few pitches to the summit of the Grand Dru via Drus traverse route. 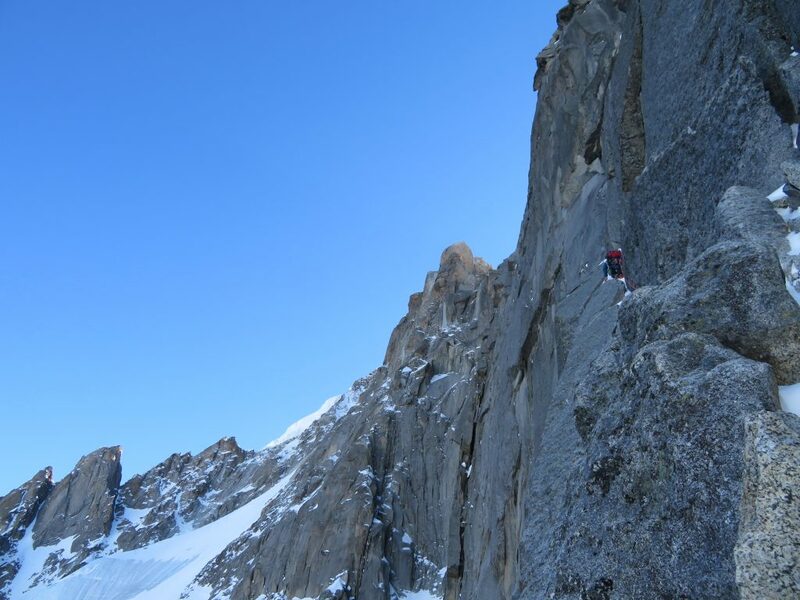 We wanted to climb the original line in the upper part as it again follows a natural line to the summit of Grand Dru. 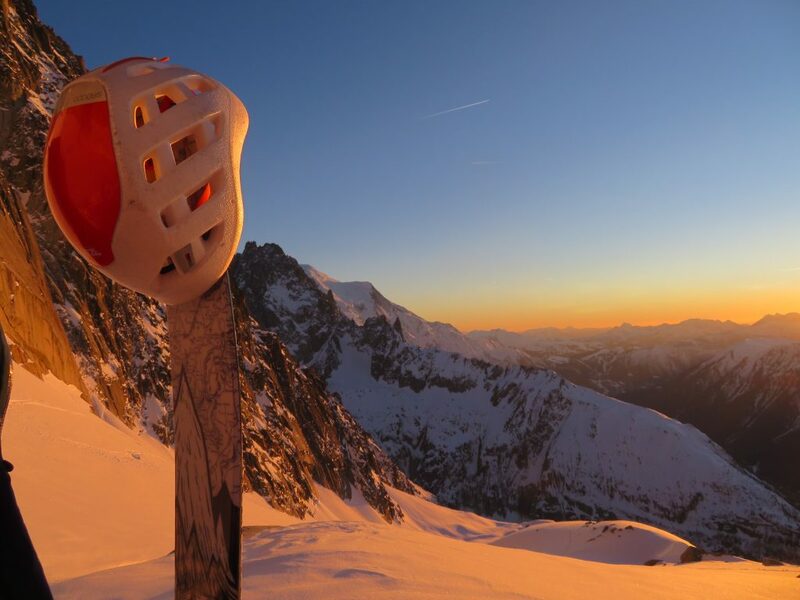 It’s too easy option to leave the game in the north couloir. Voie Lesueur with Allain-Leininger start. Picture by Wikipedia. As Compagnie du Mont Blanc is struggling to keep lifts in function we had to think how to approach Les Drus. 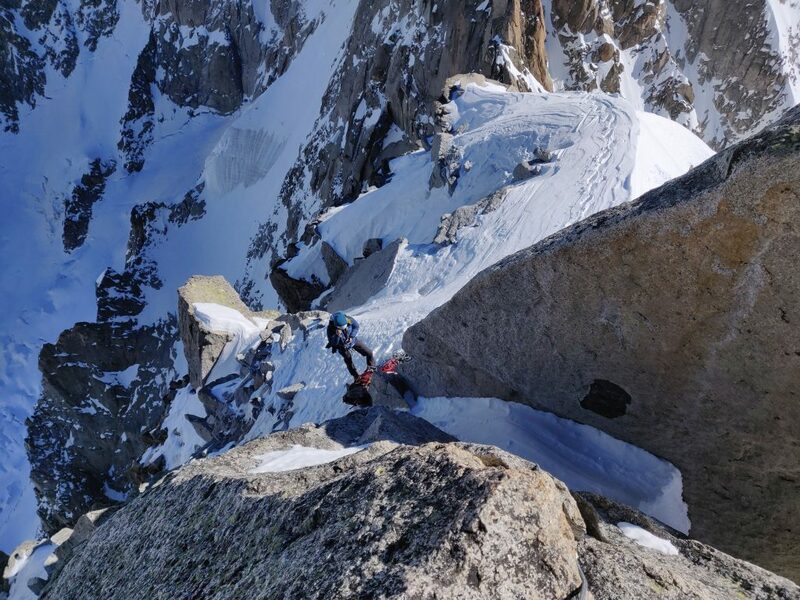 We ended up taking a Herse chairlift, skinning to the Bochard top station, skiing (downclimbing) the Poubelle couloir and skinning up the summer bivy of the Drus. Day was hotter than hell and boiling powder bowls of Pas du Chevre gave us trouble. Snow did get stuck under our skis. Evening was beautiful and windless and we slept quite well under open skies. Alarm went off at 03:45 and we were on our way around 05.00. All the pictures are of Etienne as only I had camera. Skin in! Number one sunset bivy place in the valley. Short walk to the schrund and I was off for the first pitch of Allain-Leininger which we would follow for the first couple hundred meters. Proper climbing begins after snowfields. Etienne took a first lead block and followed ramps and corners leading to the main groove which forms the middle part of the line. Already at this point climbing was tricky at times. First pitch after Allain-Leininger start. Handjams were very used here. White rockfall scar on the right. Tricky ramp pitch on the N face. Etienne sent the steep first M7 crux in a one long 60m pitch and I followed with a pack (of course we hauled the leader pack). First crux. Good hooks and short steep and powerfull section. My lead block started and I did one huge pitch to the base of the second crux. I really needed some motivation talk as I was already feeling tired from seconding with a pack. Again I did another big pitch through the M7 chimney which wasn’t that bad but M5 section above took more effort than I wanted. Slippery and smooth rock. Top of the second M7 crux pitch. Visible section is M5 and felt harder than the chimney below. From here on we did three traverse pitches, including world’s hardest M4 to gain the most unlogical part of the route. Etienne laybacked one thin and one larger crack and suddenly we were below the upper 6b crux and above our planned bivy ledge. 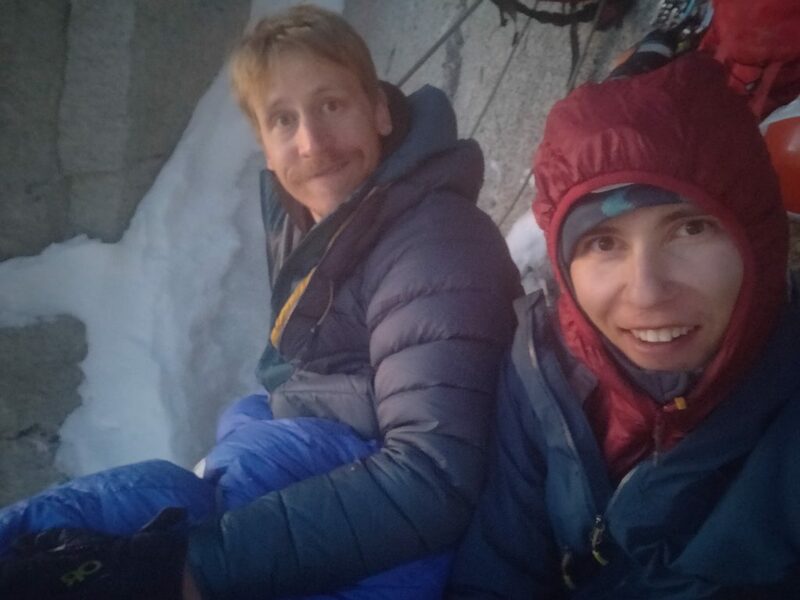 We had freed everything so far and now the plan should be set: are we fixing the 6b boulder problem now for the morning or are we leaving it to be aided next morning? I was happy with all the days effort so far but Etienne wanted to try it. A shame he didn’t took his axe ready after jamming part as it costed a free ascent but anyway now we had a rope there and we could bivy. 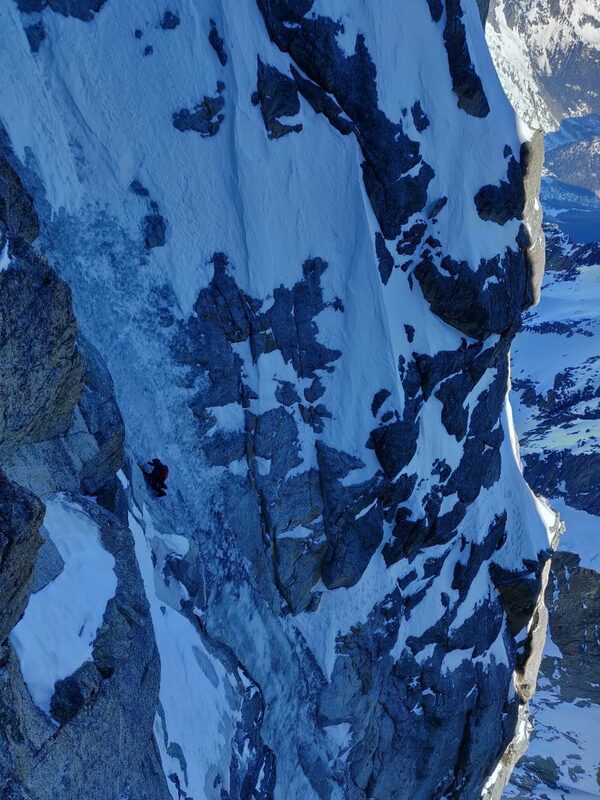 Petite Col and only one pitch and rappel to the bivy place. Upper crux is 6b boulder problem. Ledge fit two people but just. 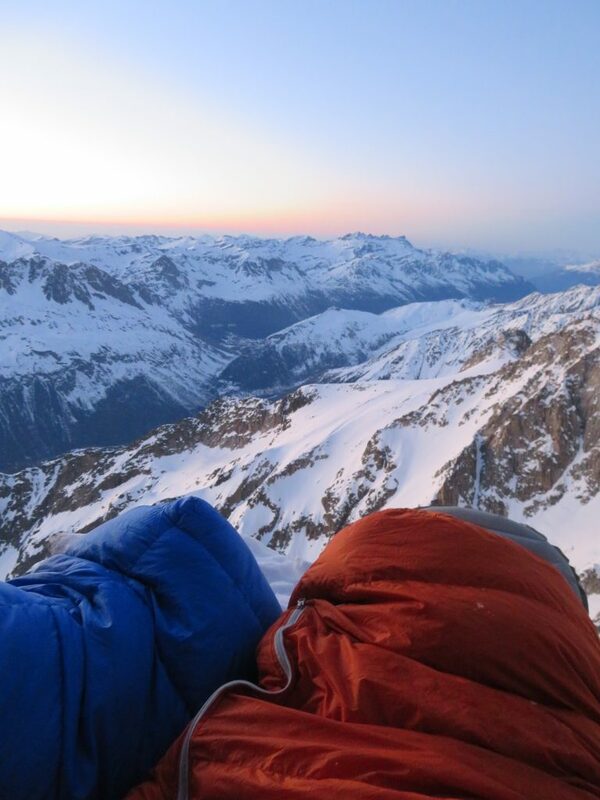 It felt like I was sliding towards Chamonix all night and Etienne dropped hot water to his sleeping bag not to make a night too comfortable. Happy to spend a night on the wall. Not so happy an hour later. Morning came like always and we jugged up the ropes in a dark. 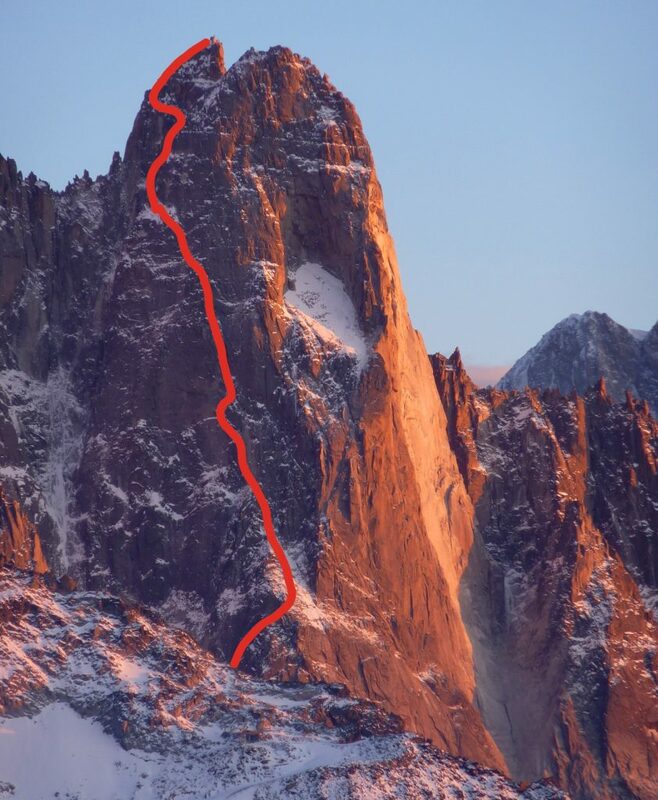 Two more pitches led to the lean north couloir which we followed for 30 meters and exited to the rising traverse on the proper north face of the Grand Dru. First of these traverse pitches was horrible with bad protection and rock. 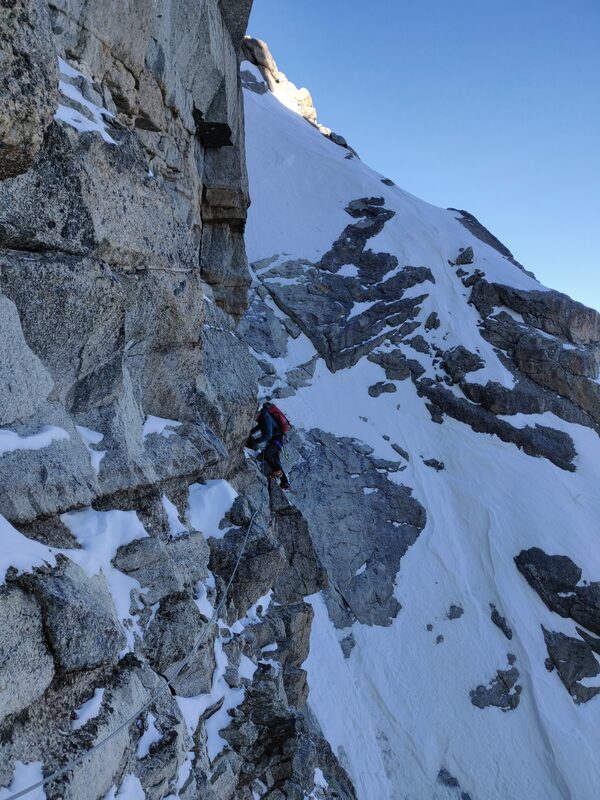 I tried not to knock off any rocks as they would fall straight to the couloir where Etienne was belaying. Reminded me from “Traverse of the Gods”. Etienne in the north couloir. See our tracks on the right. 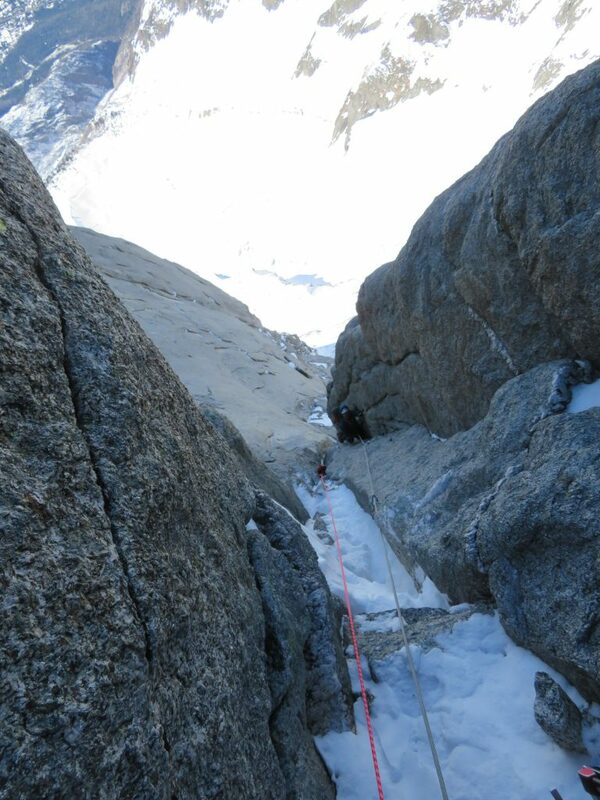 Then it was only two long simul sections to the summit of the Grand Dru. 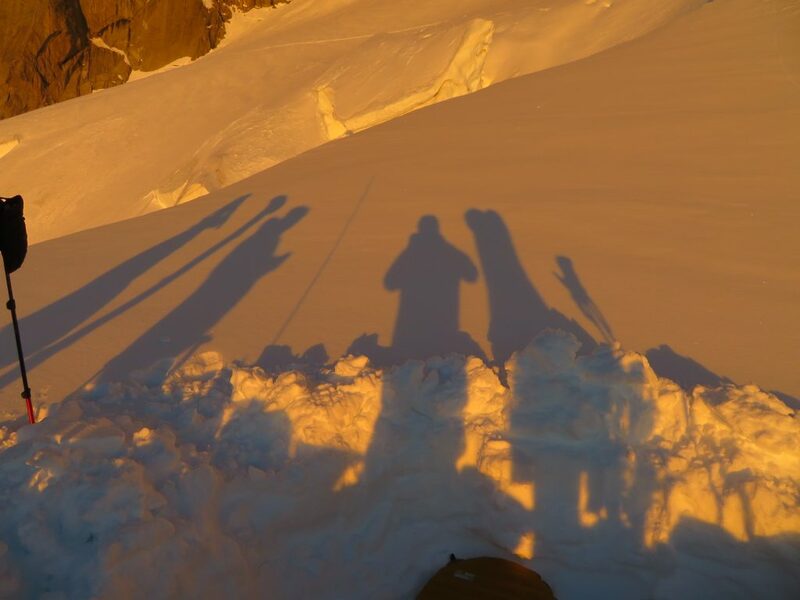 Clock was 11:00 when I stood top of the summit gendarme. Air was spring like! 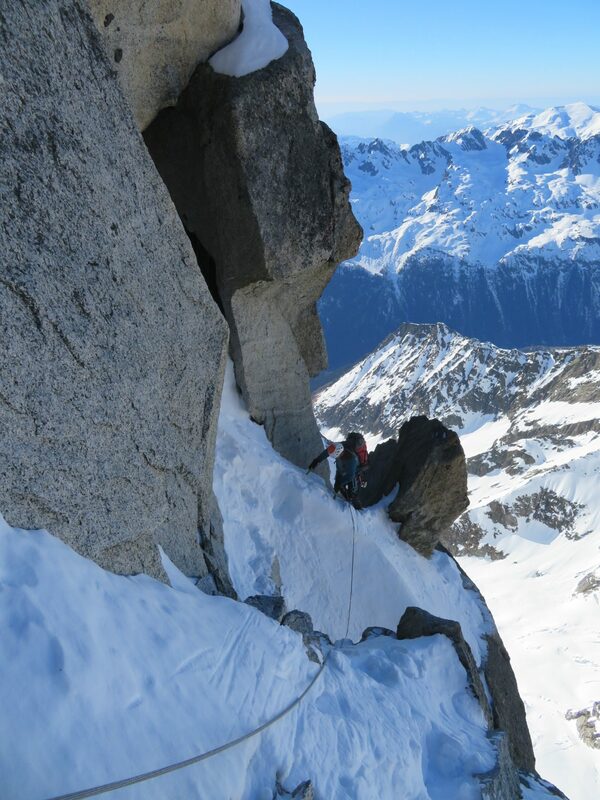 Without wasting time we rapped the north couloir and passed the german team on the way. 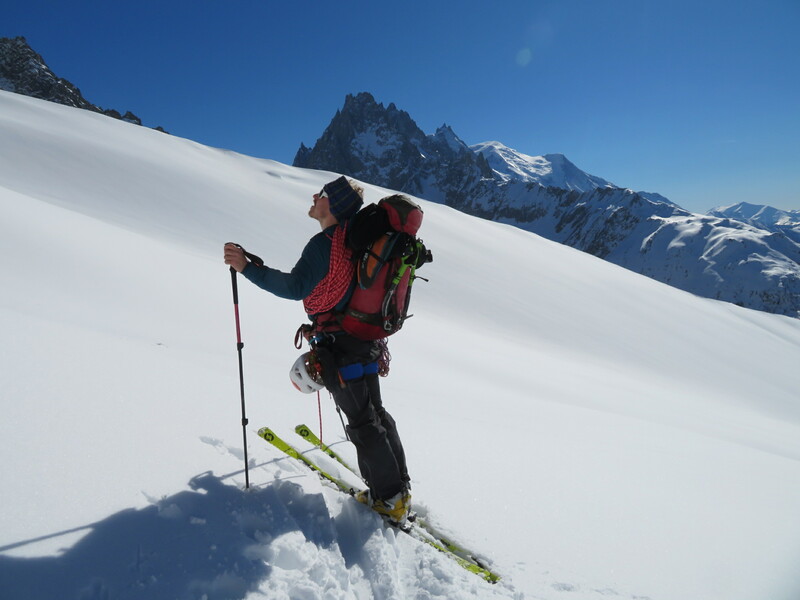 We reached our skis at 14:00 and skied to the Poubelle which wasn’t the easiest way off with skis and climbing gear on your back. Slush for hours! Summit of the Grand Dru. 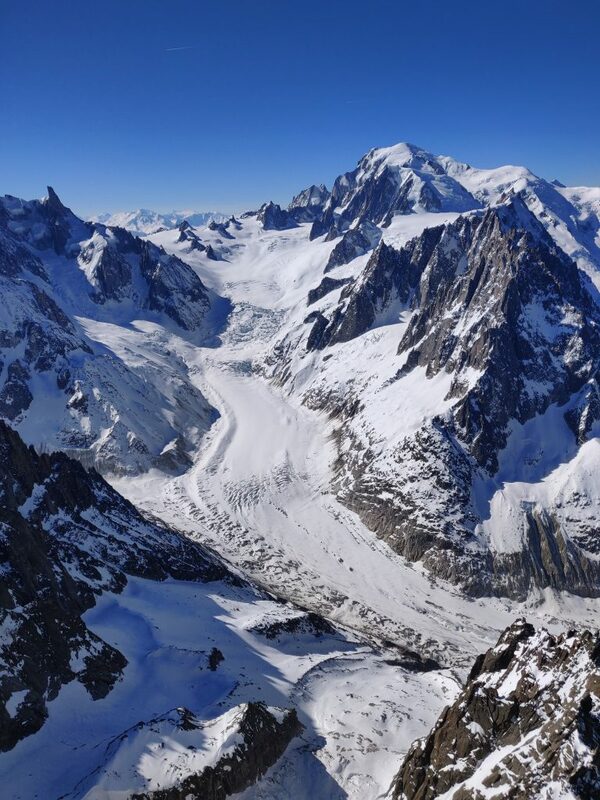 Vallee Blanche and probably hundreds of skiers doing it. Rapping off. Mainly from rock anchors. Eventually we reached Argentiere and safety of the valley. How nice spring adventure we had! Voie Lesueur was far better and a bit easier than I thought but anyway a magnificent way to climb the north face of the Drus. Route is certainly doable in a day with light pack and early start but with a bivy there’s more adventure. 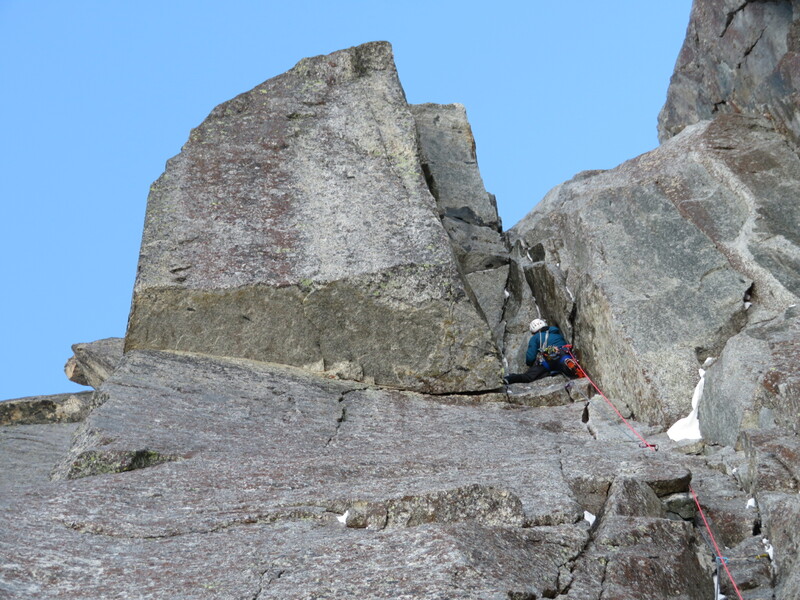 It was my first route on Les Drus but not the last. There’s few other lines I’d like to try some day.